Unless you’re shopping for an engagement ring or are a gemologist (or a Jewelry Television Network junkie), concepts like the cuts of diamonds aren’t going to be on your radar. But did you know that of the “4 C’s” that determine diamond quality - cut, carat, color, and clarity - cut is the most important? 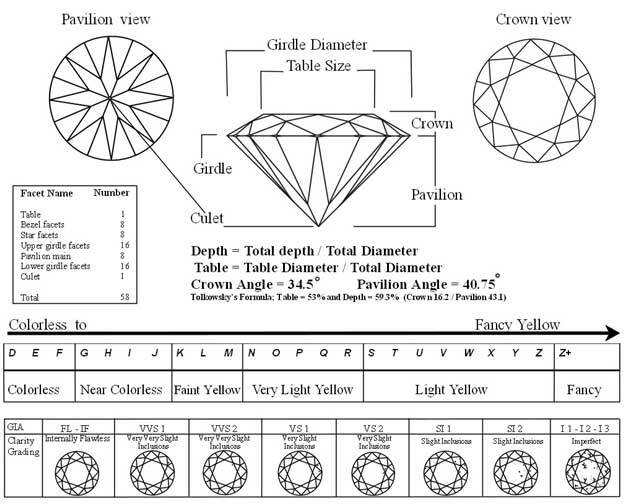 This will be your handy guide to the different cuts of diamonds, why they’re important, how to determine a good cut, and what it means for you. Question #1: What Is Diamond Cut? The diamond’s cut is, quite literally, the way the specific gem used in jewelry is cut from a larger, rough stone. The person who actually cuts the diamond, called a cutter, is responsible to balance between carat and cut. This means they must not cut a larger weight diamond (and get more carats) to compromise cut. This can be difficult, because lots of times people are more interested in the sheer size and weight of the stone than whether it was cut well, so appearances often trump quality. Cut is always different from shape. Shape is the physical outline of the diamond (round, pear, heart, princess, emerald, marquise, etc.). Shape in no way determines the cut or value of a diamond. To learn more about how a diamond is cut, watch this video. Question #2: Why is Diamond Cut So Important? The way a diamond is cut determines the amount of light that is reflected off its different facets and back out the top of the diamond, called the crown. As light enters the diamond, a well-cut one will maximize the amount of light that’s reflected off and among each facet, which is then seen by the viewer as the qualities scintillation, brilliance, and fire. Fire is the different colors that are seen as light reflects off the facets. Better-cut diamonds display these qualities to a higher degree and will look more beautiful and expensive (and they are!). Brilliance, in particular, determines the grade of a diamond’s cut. The diamond ought to be cut so that light enters it, bounces off of the internal walls or facets, and properly disperses light as it exits into multiple colors. A shallower-cut diamond will let light leak out of the sides instead of properly reflecting off the top (this is why it will appear to have less sparkle and brilliance). On the other hand, a diamond cut too deeply will not reflect light well and will have a duller color. It will also look smaller even if it is the same size and weight as a properly-cut diamond. 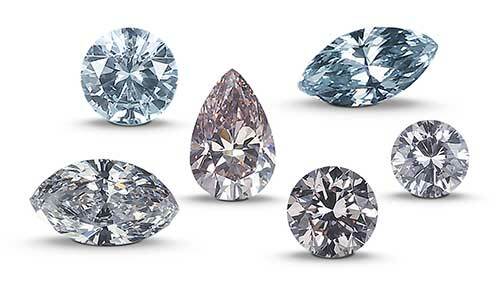 Diamonds of a higher cut grade tend to be smaller (and are thus of lower carat weight) because of the effort involved in angling and placing the different facets to maximize light reflection. Larger diamonds tend to have lower cut grading because less time is spent on cutting and shaping them. 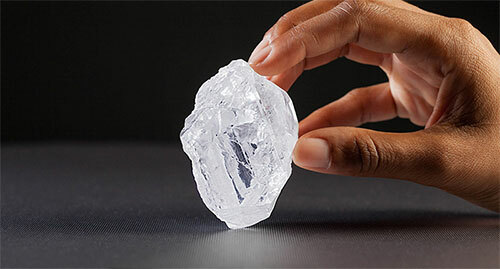 Larger diamonds will earn the cutter more money for the actual stone, but better-cut ones will cost more per carat and lower the yield from a rough stone. This makes each diamond rarer and thus more expensive. Question #3: How is Diamond Cut Determined? Multiple facets determine cut grading. Gemologists take into account things like proportion, polish, symmetry, and ability to reflect light. We have already looked at light reflection, so let’s examine the other factors. Proportion describes the relationship between the size, shape, and angle of each of the diamond’s facets. Many different combinations are possible. 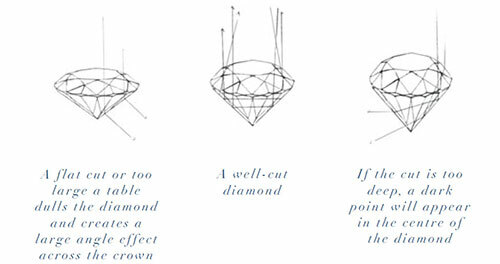 It is the proportions that determine if a cut diamond is too deep or too shallow. Depth refers to the distance between the very top of the diamond (called a table because it is a flat surface) to the very bottom, which is sometimes called the culet. Depth is measured in millimeters. Depth Percentage is determined by dividing the depth by the width. A lower depth percentage will mean the diamond will appear larger (but may not actually be larger). This is determined by dividing the width of the table by the width of the total diamond. 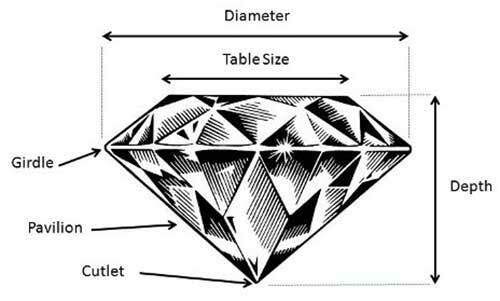 Differences between the table percentages of diamonds that have the same cut grade are not important, unless the buyer wants the diamond to look bigger. After the diamond has been cut from the rough stone, it should be professionally polished. This step is critical. High-quality polishing will leave few or no imperfections or scratches behind. Lower-quality polishing will scratch or nick the stone. This will make it worth less. Low-quality polishing also makes the diamond less able to reflect light, which means the gem’s cut will be lowered too. A diamond of superior cut will have symmetrical, properly-aligned facets. Uneven, inelegant, or awkwardly-cut facets will reflect light poorly or not at all. Diamonds with well-cut facets will reflect and refract more light and thus have a higher cut grade. Additionally, cut grade is determined by how well all the different parts of a diamond are cut and whether they play nicely with each other. Because these terms will come up later, I define them below. Table - The very top, flat surface of the diamond in the center. Crown - The faceted part of the diamond surrounding the table on the diamond’s top. Girdle - The outer edge of the diamond between the crown and the pavilion. This is also the widest part of the diamond. Pavilion - The bottom part of the diamond, beneath the girdle. A pavilion is made up of two kinds of facets: Lower main, and girdle. Culet - A very tiny facet some cutters add at the bottom of the pavilion. Not all diamonds have these. Their purpose is to protect the diamond’s pavilion from becoming chopped or damaged. The best-cut diamonds possess a luminous quality that give off a vast amount of brilliance and fire. It is important to remember that standards for grading cut may differ depending on the gemologist or laboratory evaluating the stones. Make sure you are working with the highest cut grade you can afford. Any reputable jeweler can help you make this determination. Find out more about diamond certificates and grading here! Question #4: What Are the Different Cut Grades, and What Do They Mean? The main laboratory which issues grading certificates for diamonds is the Gemology Institute of America (GIA), located in Carlsbad, CA. Independent jewelers and other companies may have in-house standards which are different from the ones used by GIA. Be sure to ask your jeweler to evaluate your diamonds based on GIA standards. A concise description of each category follows. 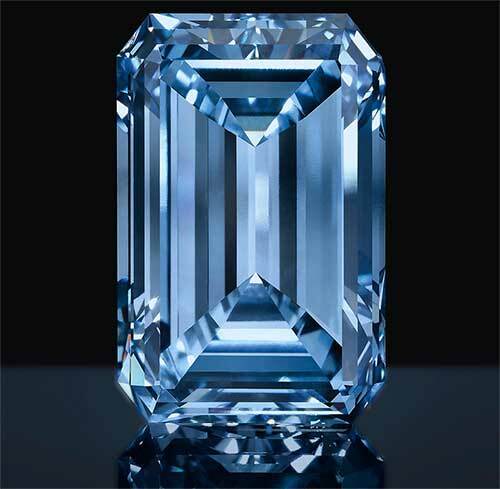 These diamonds are of the highest cut, and reflect the most light. Some diamonds in this category may occasionally have less-than-perfect proportions or other nuances of difference but are still of great quality and value. All diamonds in this category will have an even pattern of light and dark elements. These diamonds will not necessarily have anything wrong with individual proportions. However, the specific combinations of proportions would cause them to have too many light or dark elements, too-steep crown angle, too-long facets on the lower girdle, or other imperfections. However, they are still of very good quality, and should be considered if one cannot afford a diamond in the excellent category. Different issues put diamonds in this category. Usually, they are flaws more serious than those in the Very Good category that specifically lessen scintillation. Often very shallowly-cut diamonds or those with very steep crowns, too-large tables, or odd pavilion angles land in this category. These diamonds will look cloudy, dark, and muted. These diamonds are the worst of the bunch, with outrageous proportions that badly affect carat (especially those that have diameters highly disproportionate with carat weight), excessive depth, massive table size, and other fatal flaws. 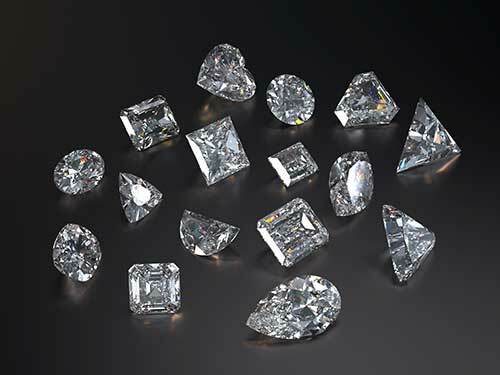 These diamonds reflect little to no light and are extremely cloudy, dull, and dark. Question #5: How Does Diamond Cut Affect Me? In multiple ways. The uppermost, of course, is that it will impact the quality of the diamonds you wish to buy. As such, you need to understand cut (along with the other 3 C’s) in order to make sure you are buying the best-quality diamond for the price and for what you can afford. Additionally, diamond cut will also affect the appraisal and resale value of diamonds you already possess. 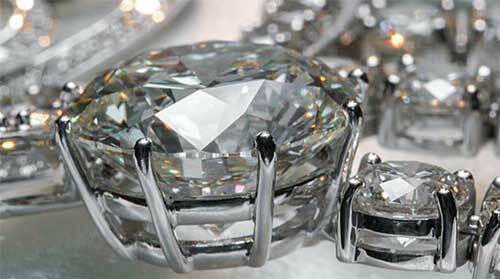 Better-quality diamonds in very good condition will sell for more money and be appraised more highly. Proper cut impacts all of us where it matters most—the bank account! Not all diamonds are created equal. Different factors affect their value, quality, monetary worth, and even physical appearance and beauty. Of the “Four C’s” that determine what to look for in the acquisition of a quality diamond, arguably “Cut” is the most important. After all, the way a diamond is actually hewn from the rough stone affects virtually every aspect of it. This in turn impacts different aspects of its worth and visual appeal. Knowing the basics of what makes a good cut is your first step to finding a truly valuable diamond worth the effort—and the price! If you are interested in finding the perfect loose diamond for your engagement ring, please contact J.R. Dunn Jewelers and we will be happy to guide you in making the perfect choice.